I’m very behind on posting. The One Room Challenge took over my life for the past month! lol. 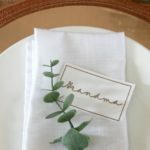 But it didn’t stop me from learning how to make place cards for the Canadian Thanksgiving holiday season – it just delayed me from writing about the experience :) . Yup, that’s right. I learned how to make place cards for my family’s Thanksgiving dinner. 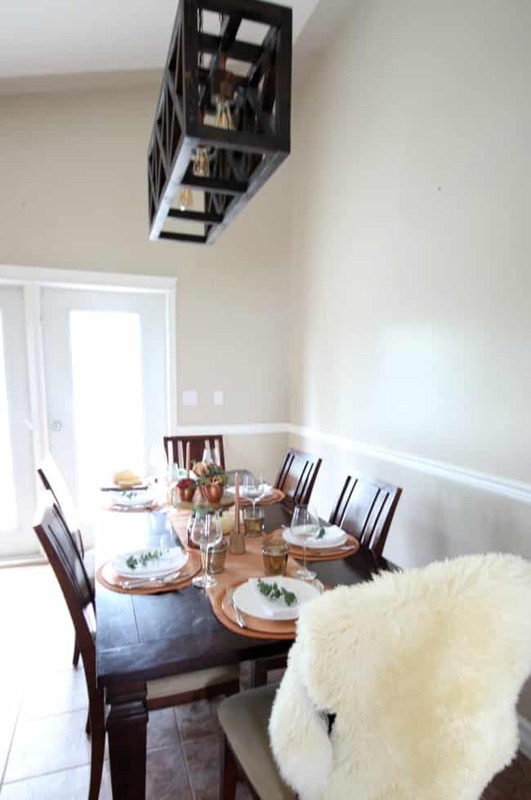 Thanksgiving is a cherished holiday in our home and I love to indulge in our family dinners. To me, Thanksgiving is a cozy, comforting holiday and a great reason to be with loved ones. It’s a special time for where everyone can stop and appreciate all the things in life that we often take for granted on daily basis. There’s great food and although the dinners can be extravagant and delicious, they always seem to come together more seamlessly then they do at Christmas time. 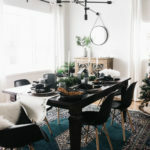 Thanksgiving dinners at our house often include warm appetizers, a turkey with all the fixings, hot side dishes, salads and delicious desserts, topped off with some wine and beautiful décor. The crisp autumn colours around this time of year are some of my favorite to work with for DIY décor projects. 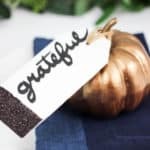 This year, I decided to learn how to make place cards with a Cricut place card template to add to my Thanksgiving fall copper tablescape. What is a place card and why should you make one? A place card is a piece of paper or cardstock that indicates where someone is supposed to sit at a table. The person’s name is written or printed on an individual card. 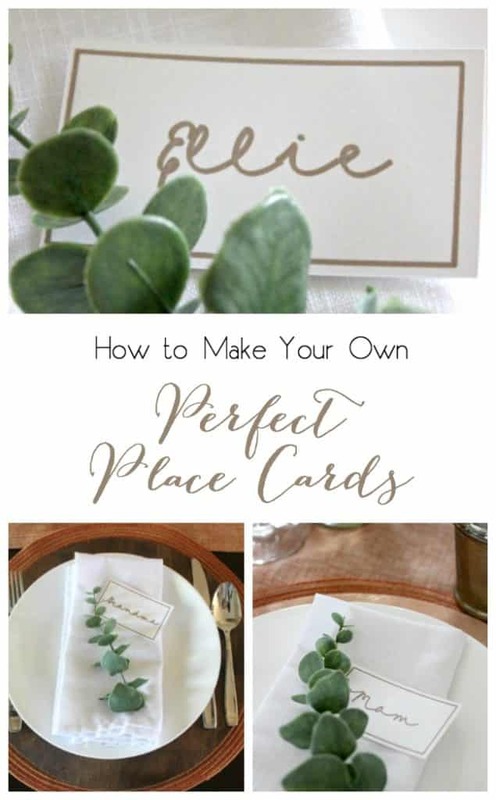 The card can sit delicately just above the dinner plate, on top of or tucked into a fold on the napkin, in a decorative place card holder, or on the plate. 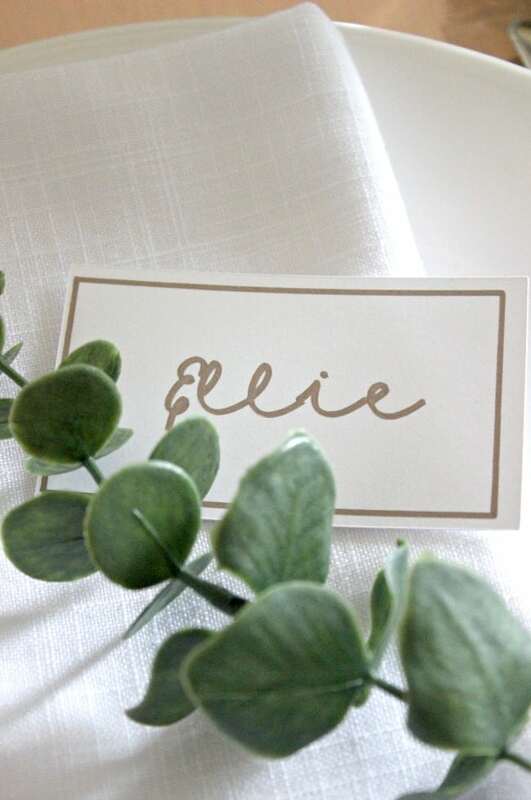 People often think place cards are only used at large, formal events, such as weddings, but in fact they can be a nice added touch to any celebration, small or large. I think place cards can be a beautiful, inviting, nice addition to any table setting. I’ve always admired people who knew how to make place cards, because I’d never learned how to make them before! One of the reasons why I’ve never learned how to make place cards before is because they look so complicated! You know when you see other people’s skills and you get jealous, thinking, why can’t I do that?! Or a simple task just seems daunting and overwhelming because you don’t even know where to start? It’s not just me, is it? Well, I have the worst handwriting. Ever. It’s embarrassing. So I always thought DIY place cards were off the table for me (pun intended). That’s why when the Cricut Explore came out with a way to WRITE, I was ecstatic. 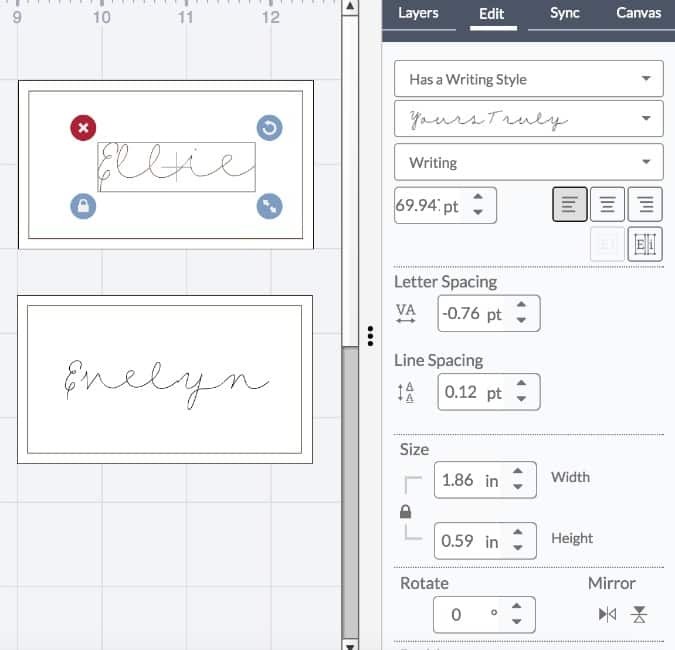 I even wrote a blog about this writing feature: How to Use the Cricut Writing Feature [when you have awful handwriting!] So needless to say I couldn’t wait to find and use a simple Cricut place card template. If this is your first time hearing about a Cricut Explore, you might be thinking, what is that? Who needs one? Or if you’re familiar with Cricut you might be wondering if a Cricut Explore is different than a Cricut Maker? Cricut (pronounced ‘Cricket,’ like the game or the insect) makes versatile, compact, affordable machines that allow you to tap into your creative side and make things that you’d never think you could! They can print digital images on almost any type of material. 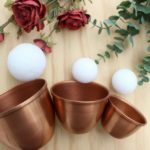 You can choose from hundreds of images in the Cricut Design Space, you can design your own images in design space, or you upload your own images to print and the machine prints them out for you on the material of your choice. It sounds fun, right? Trust me, it is! My love for Cricut goes back years, even long before I started blogging. To learn more about the Cricut Explore, visit my blog post: Cricut Explore Creativity. With the Cricuit Explore, I’ve made canvas art, gallery wall pieces, bridal shower decorations and more. And it turns out, the Cricut Explore is the perfect tool to use to learn how to make place cards. 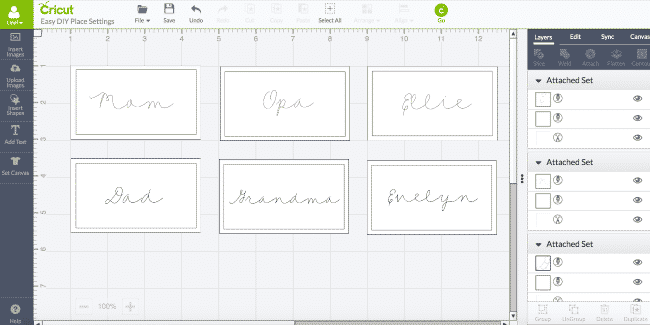 I’ve put together a simple yet elegant Cricut place card template that anyone can use. 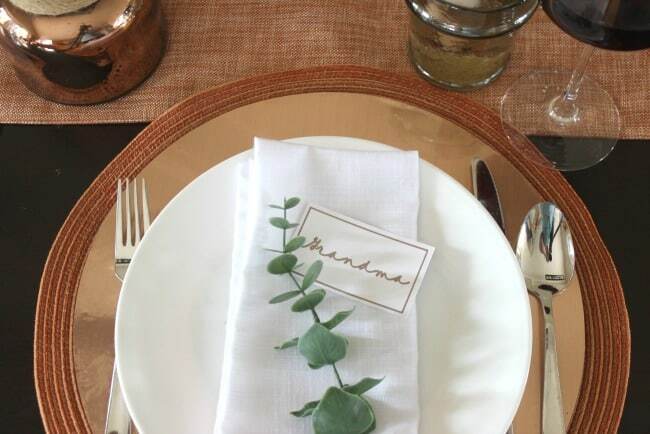 A few things to keep in mind before getting started on learning how to make place cards includes: determining your theme, colour scheme, size and available material. For this craft my theme was Thanksgiving, my colour scheme was copper, I knew I wanted something small enough to rest on my folded cloth napkin and I had some cardstock paper on hand. 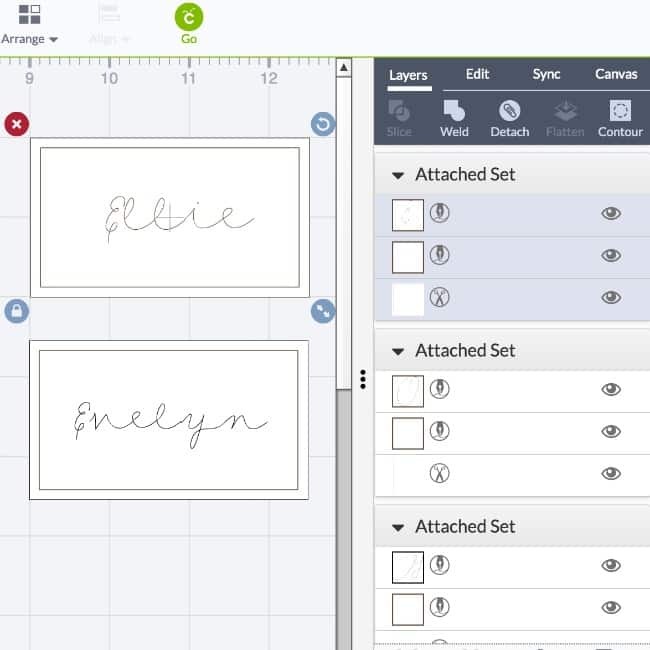 Start by making two rectangles on your Cricut Explore Air™ 2. My first was 3.5″ by 2″ and the other one was 3.25″ by 1.75″. Change the smaller rectangle to a “writing” one by clicking the image, and changing the icon from the “scissors” to the “pen” (see images). Next, add text (image above). I used the font “Yours Truly” here, and I changed the letter spacing to -0.76 so that the letters would connect without spacing, like cursive writing. Make sure you have it set as a writing font, and set in the same colour as your written rectangle above [choose the colour when you click on the photo in the edit bar]. Finally, make sure that your three layers are attached. Select all three layers at the same time (written name, small rectangle, and larger rectangle), and click “attach”. That will set the writing in place, so the outside rectangle will be cut after the name and rectangle are drawn on. It took me less than five minutes to design and cut these! I love them and think they look elegant and timeless. That’s why I HAD to share this DIY with you. If you have a Cricut, this is gold! Not to mention you can use this Cricut place card template over and over again – just save the file and edit the names every time you have a party. I can almost guarantee your guests will be impressed. My family loved them at our Thanksgiving table and now I have a quick and easy Cricut place card template saved to use for our next event! Amazing. 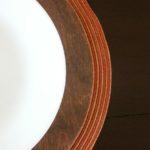 Here are some pictures are from my Thanksgiving tablescape. Our Canadian Thanksgiving was a month ago, but like I said, I’m very behind on posting. However I still really wanted to share this project because it’s perfect for any holiday, party or tablescape – not just Thanksgiving. Plus, my friends down south haven’t had Thanksgiving yet. 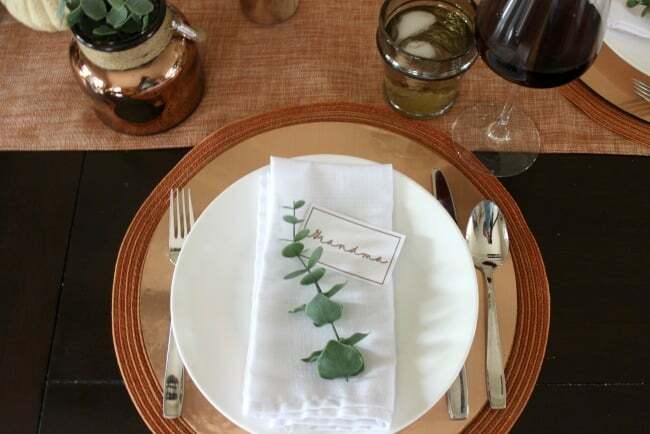 Hopefully after reading this, you can make the perfect place cards for your next event. 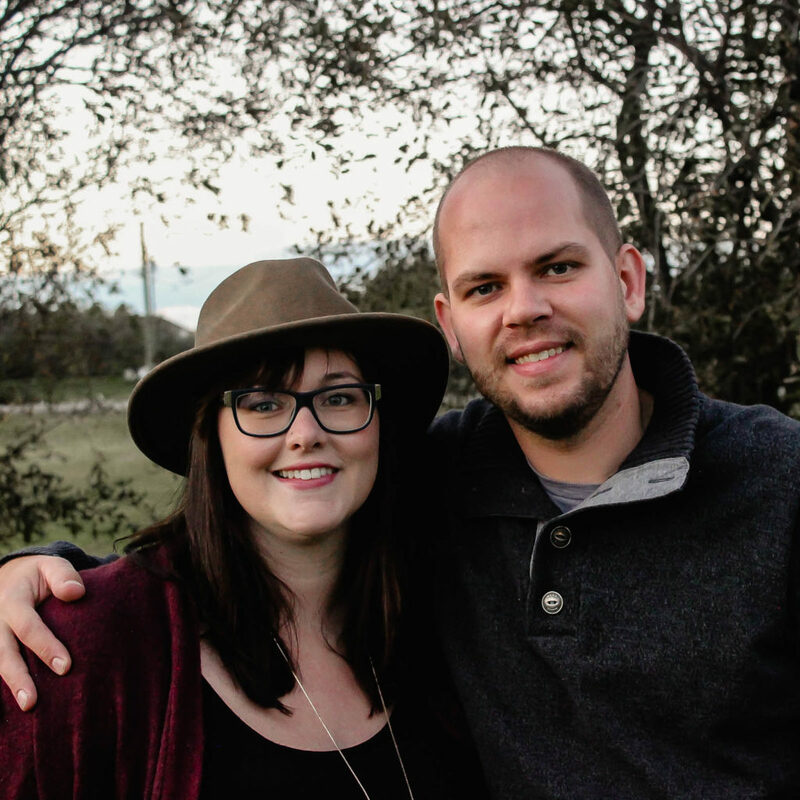 You can see how great they looked in my full fall tablescape here. 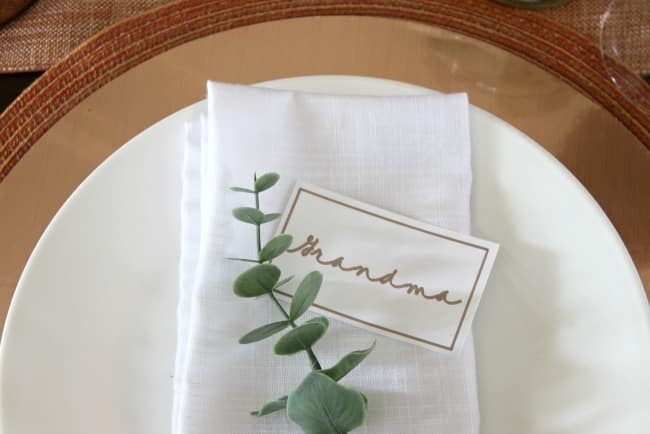 Have you made place cards before? Do you have a Cricut place card template to share? Or did you try out this one? Let me know! I’d love to hear from you. Making these perfect cards is just a piece of cake.Happy making! I am a brand new Cricuit Air 2 crafter and I have had fits trying to figure out lettering and cut for name cards as I am a wedding planner and would use these all the time. Lots of searching and then found your blog. It was soo very helpful – thank you.